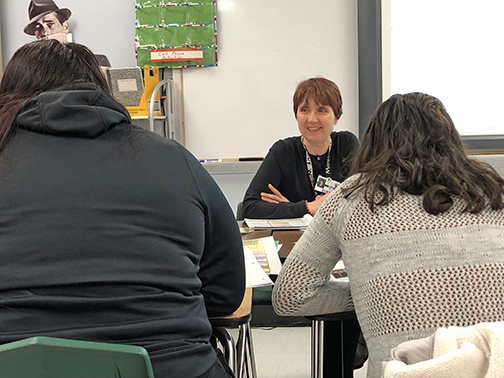 Kathleen O’Keefe, an English language teacher at Pattonville High School, is among a select group of teachers across the United States to receive a renewal certification as a National Board Certified Teacher (NBCT). O’Keefe initially received her National Board Certification in 2008 in the area of early adolescence through young adulthood/English as a new language. NBCT is considered the gold standard in teacher certification and is designed to develop, retain and recognize accomplished teachers and to generate ongoing improvement in schools nationwide. Certification is awarded by the National Board for Professional Teaching Standards (NBPTS), and teachers are required to renew their certifications every 10 years. The National Board Standards upon which the certification is based were created by teachers for teachers and represent a consensus among educators about what accomplished teachers should know and be able to do. Board certification is available in 25 certificate areas spanning 16 disciplines from preschool through 12th grade. The certification process requires teachers to demonstrate standards-based evidence of the positive effect they have on student learning in alignment with NBPTS' Five Core Propositions. They must exhibit a deep understanding of their students, content knowledge, use of data and assessments and teaching practice. They must also show that they participate in learning communities and provide evidence of ongoing reflection and continuous learning. English learner teacher Kathleen O'Keefe works with students at Pattonville High School.